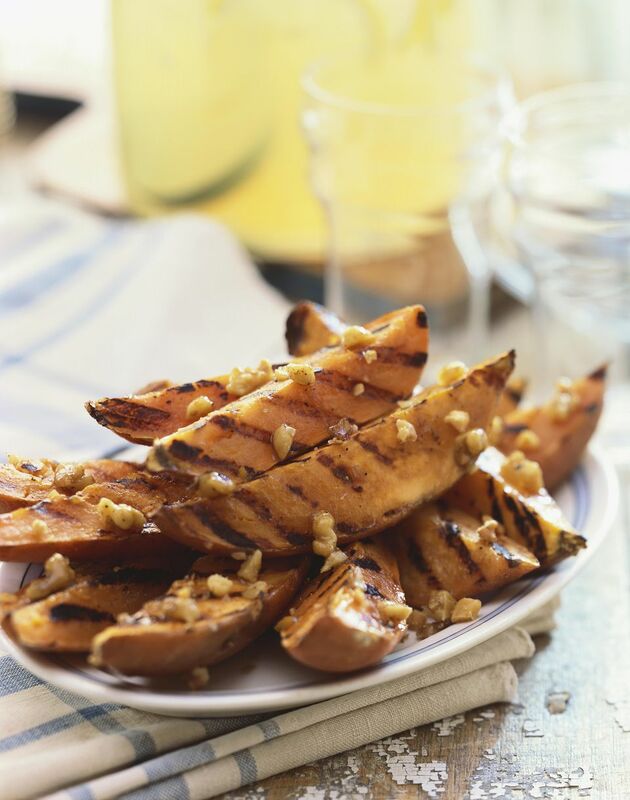 Save the oil for something else because these sweet potatoes are fried right on the grill. The only oil you'll need is about 1/4 cup. Just enough to get them crispy. While they grill these fries are brushed with a salt and lime vinaigrette that adds the right amount of flavor to make them delicious! While it is heating, cut off the pointy ends of the sweet potatoes. Then cut in half lengthwise and each half into three or four wedges, depending on the size. Drop the wedges into the boiling water and let cook for about 5 minutes, while you light the grill. Remove sweet potato wedges from the water and place on a couple of paper towels on a large plate and allow time to drain about 5 to 6 minutes. Mix together oil, lime juice salt, oregano, and cumin. Using a large pair of grilling tongs and a folded piece of paper towel, apply several coats of oil onto grill grates. Immediately start brushing about 1/2 of lime-oil mixture onto the potatoes, turning them over until they are all coated in seasoning mixture. Place onto grill and cook for a few minutes. Reduce temperature, or move to a cooler part of the grill and continue grilling until done. Brush with remaining lime-oil mixture during the cooking process. Sweet potato fries should be soft through the middle, but firm enough to hold together. Once cooked, remove from grill and arrange onto a platter. Serve with a dipping sauce or aioli of your liking. These also go really well as a side dish to grilled fish, chicken, pork, and even hamburgers. Leftovers can be stored in an airtight container and reheated in the oven. They will not retain its crispiness, but they will still be quite delicious.